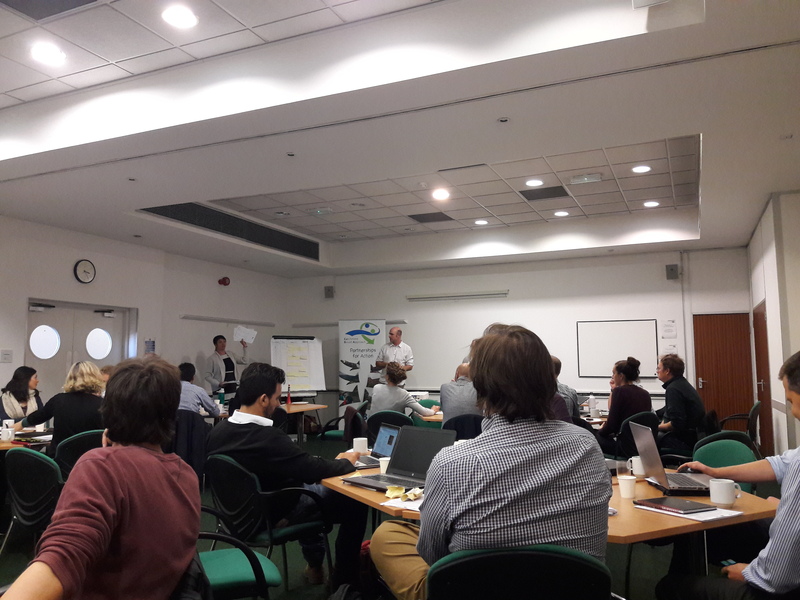 A couple of weeks ago, I attended the CaBA Catchment Data User Group (CDUG) Forum in Birmingham, run by the Rivers Trust. 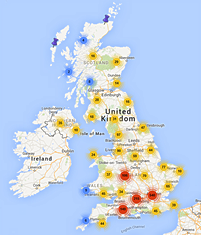 CDUG was established in 2011 to open up datasets and encourage data sharing nationwide. This forum was an opportunity for a number of organisations to come together to share knowledge and discuss opportunities to collaborate. Michelle Walker and the team at the Rivers Trust did a brilliant job putting together a jam packed programme full of interesting talks, lightning 5 minute presentations, and discussion/brainstorming sessions. After an introduction from Michelle on why we had all gathered for the meeting, keynote speaker Becky White from Defra spoke about the goals of the 25 Year Environment Plan and the importance of Natural Capital. Becky mentioned how this concept considers elements of nature which benefit people and the country’s economy on a national scale. This is a system which recognises pressures and drivers to generate a healthy economy and improved social wellbeing, through policies and strategies embedded at the local level. The Pilot phase of local Natural Capital plans will look at delivering the 10 goals of the 25 year plan, with locally determined priorities for particular catchments. One consideration which Becky mentioned and was discussed at the forum is the issue of spatial scale, and setting objectives which make environmental sense at local levels, especially when crossing catchment boundaries. Becky stressed the need to break down silos in decision making, and improve collaboration through bringing in other groups to the decision making process. The next set of presentations were based around how Catchment Partnerships are currently utilising data for decision support. Ellie Brown from the Ribble Rivers Trust presented her work using data to prioritise environmental restoration including fish passage location. Data is also used to secure funding, engage stakeholders through data visualisation, ensure cost-benefit for resources invested, increase interest in rivers, improve collaboration and share the message of restoration more easily. Ellie used an app in ArcGIS to automate the process of prioritising barrier removal across the catchment. This type of data analysis can be integral to decision making by ensuring the best decisions are made to improve fish migration. Other information can also be used to identify where to create riparian woodland for rivers which will generate the greatest benefit including reducing runoff and creating shade for rivers. Sarah Wigley & Simon Browning from Westcountry Rivers Trust then presented on their work using evidence to create reference maps for spatial targeting, monitoring and recording outputs, as well as for communication and engagement. Simon & Sarah also commented on the use of data to prioritise areas for work, including mapping issues and opportunities such as green roofs. These opening sessions led into the lightning presentations. A large digital countdown clock was displayed on the wall for the whole room to see, and more than 15 presenters were faced with the task of sharing their experience or case study, before their 5 minutes was up! This session proved to be both amusing and engaging, with lots of ideas and research being shared, illustrating the variety in the use of data and evidence for environmental benefit. Some of the topics covered included the use of the SCIMAP website developed by Durham University to show sediment input across a catchment; the use of citizen science and MoRPh surveys for data collection and monitoring; the importance of the data source and quality of random sampling; and using data for improving community engagement in their local environment. It was great to see that lots of organisations have used data to monitor their catchment through mapping and modelling. We were offered half a dozen options including improving uptake of the use of data, collaboration, and dataset access and availability. The room took a moment to vote using the keypads provided, and the outcome showed a mix of opinions, with the main barriers identified as a lack of technical ability in catchment partnerships, and poor access to datasets. Once again we were offered a number of options including the repurposing of data and skills, a nationally consistent evidence database, and the option to use CaBA as a hub for sharing data and evidence. The room voted once more and the opinions were mixed, although the use of third party data and improving engagement in modelling trumped the other options selected. These interactive sessions definitely sparked conversation amongst the delegates and other options were put forward to consider including the barrier caused by lack of support for revenue funding. There was plenty of time to network over lunch, plus see demonstrations of some models and tools, before convening again for the next session covering issues raised at previous CDUG events. One of these issues was whether there was a need for a national approach for local data, and how metadata in datasets can help improve validity and accuracy. The issue was raised that data standardisation nationally would make it easier for datasets to be merged into a central database, even if modelling, mapping and analysis remained local for each organisation’s specific needs. The group then split into two to look at different approaches to data. Toni Scarr from the Environment Agency led a session on the use of data to drive effective engagement; whilst Steve Erdal from the data company Nerds with Words led a discussion on the large amounts of unstructured text data and the difficulties of language in data. The structure of language, use of keywords and sense of the text i.e. whether the word is positive or negative, help explain how language is like architecture and therefore we need to be able to understand what we are trying to put across and who we want to be able to understand it. The groups brainstormed a couple of points to consider during a consultation, including what can contribute to a successful consultation; how we can make the best use of language; and how the use of language differs depending on what organisation or sector we are trying to approach. Relevant language and understanding your audience is therefore key to any data collection method. Following another quick coffee break to gather our thoughts, the final wrap up session outlined the main points of the day and future steps. There is a need for catchments to work together in managing Earth’s water and soils; we need to collaborate with everyone, not only those involved in the environmental sector directly; and we need to consider language and how it is perceived by different parties. For example Natural Capital has a different meaning to different people. Thank you to Michelle Walker, Anneka France and Dave Johnson from the Rivers Trust for organising and facilitating this engaging discussion forum. This was a great chance to get up to speed with what is going on in the industry and think about how we can improve our data sharing and utilise what evidence we have to support decision making. For more information, please see this link to the CaBA Forum post with links to presentations from the day.